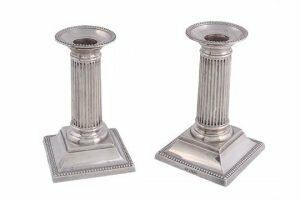 A pair of silver small columnar candlesticks by William Hutton & Sons, Sheffield 1919, with bead outlined circular detachable sconces, on spreading square bases with a beaded border. 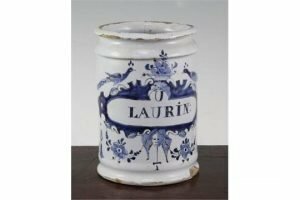 A Delft blue and white cylindrical wet drug jar, early 18th century, titled ‘U LAURIN’ and within a strapwork cartouche surmounted by peacocks and with a winged angel head to the apron. 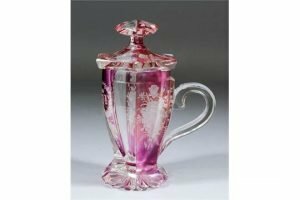 A 19th Century Continental pink flashed glass hexagonal cup and cover, three panels engraved with bunches of flowers. 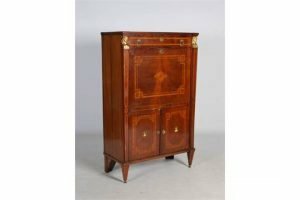 A 19th century Continental mahogany and parquetry inlaid escritoire, the rectangular top above a long drawer and hinged fall front, opening to a fitted interior, flanked by gilt wood capped caryatid tapered cylindrical supports, above a pair of cupboard doors, raised on tapered square supports with brass ball feet. 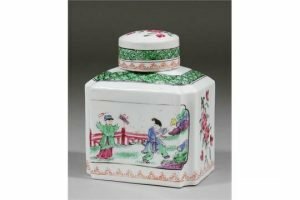 A 19th Century Continental porcelain rectangular tea caddy with canted corners, painted in the “Famille Rose” palette in imitation of the Chinese with panels to either side of people in landscapes, the ends with prunus blossom. 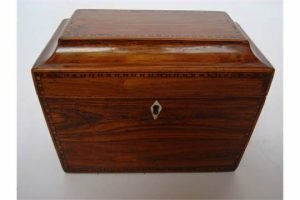 A Regency Kingwood sarcophagus form tea caddy, box wood and ebony strung with Tunbridge ware style micro banding, the hinged lid opening to reveal an interior with two lidded compartments, with original lock and ivory kite form escutcheons. 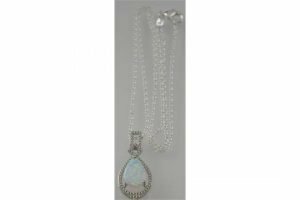 A silver cubic zirconia pear shaped opalite pendant necklace. 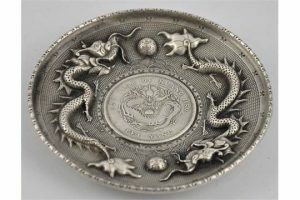 A Chinese metal ashtray decorated with dragons and fitted with a Guangxu era coin. 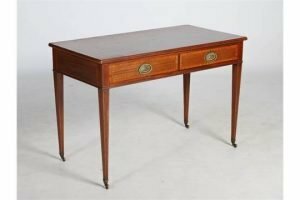 An Edwardian mahogany, parquetry and satinwood banded side table, the rectangular top above a long frieze drawer with faux drawer fronts, raised on tapered square supports with brass cups and casters. 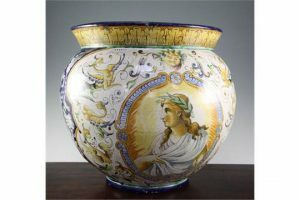 An Italian majolica jardiniere, 20th century, in 17th century Deruta style painted with portrait medallions of an emperor and a goddess, panels of grotesque masks and ornament. 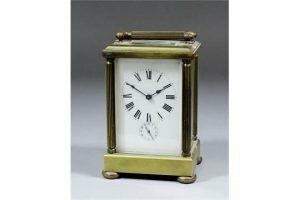 An early 20th Century French carriage timepiece with alarum, the white enamelled dial with Roman numerals to the eight day movement, with alarum bell to base, contained in brass and bevelled glass case with reeded columns to corners and conforming folding handle, on bun feet. 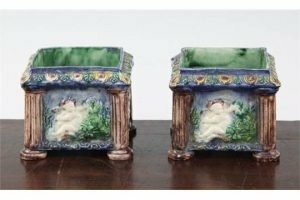 A pair of Palissy style square cache pots, 19th century, each side moulded in relief with the seated figure of a cherub amid foliage, the corners modelled as columns between egg, dart and leaf moulded borders, decorated in colours. 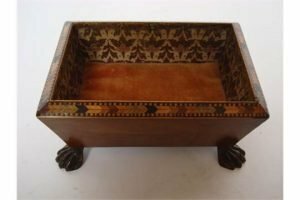 A 19th Century satinwood parquetry banded sarcophagus form trinket tray, the interior with padded velvet bottom and original foliate design paper lining, on cast brass paw feet. 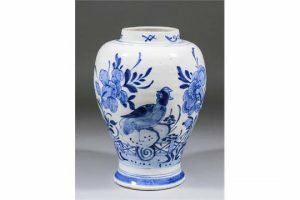 A late 18th/early 19th Century Dutch Delft blue and white baluster shaped vase painted with a bird on a rock, with fence and flowering branches. 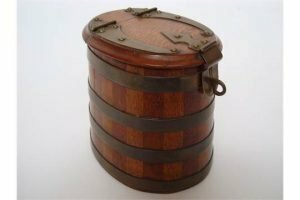 A Victorian brass coopered oak and mahogany tobacco box, of tapering oval barrel form with alternating mahogany and oak staves, the lid with cut brass hinges. 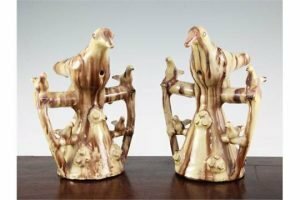 Two Yorkshire glazed red pottery figural bird whistles, second half 19th century, modelled as a bird perched on a tree stump, with mottle ochre and brown glaze. 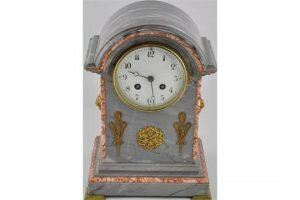 A 19th century Sienna marble mantle clock, with 8 day movement striking on a bell. 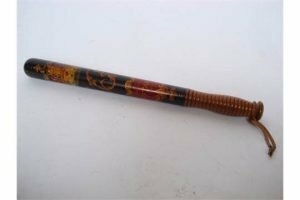 A Victorian painted policeman’s truncheon by William Parker, painted VR cypher under a crown and inscribed ‘Constable’. Ribbed grip handle, pommel stamped ‘Parker 233 Holborn’. 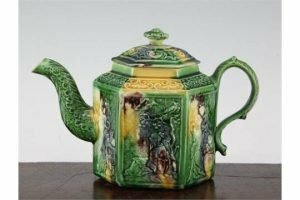 A Staffordshire lead-glazed creamware hexagonal teapot and cover, c.1760-5, of Whieldon type, with rectangular panels of Chinese figures on a fretwork ground.